The Organizational Science doctoral program is an interdisciplinary program focusing on employee and organizational health, well-being, and effectiveness. Organizational Science is both a science and a practice, founded on the notion that enhanced understanding leads to applications and interventions that benefit the individual, work groups, the organization, the customer, the community, and the larger society in which the organization operates.The program faculty (20 core members) come from (in alphabetical order): Human Resources Management, Industrial/Organizational Psychology, Organizational Behavior, Organizational Communication, Organizational Sociology and Social Psychology. Find out more about the Organizational Science Ph.D. program by viewing the course catalog on UNCC's website. 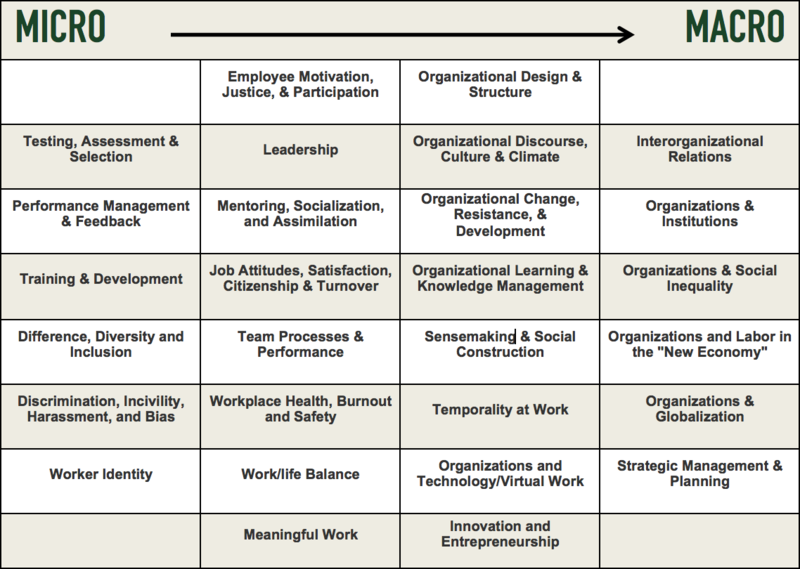 The matrix below presents a good sampling of the topics that comprise an Organizational Science PhD. Our students learn about many of these topics, and often focus extensively on 1 to 5 of them in their research. In this video, students from various perspectives within the program share their experience with the Organizational Science program. In these videos (click "YouTube" to enlarge), our faculty discuss their perspective on the program and Dr. Cliff Scott shares his point of view as a professor of Organizational Communication within the OS Faculty. To learn more about the program, please read the article published in the UNC Charlotte magazine for alumni and friends.